Mix one part master mixologist, one part Phoenix Magazine, add a splash of elbow-rubbing and you’ve got the recipe for Summer Cocktail Camp 2018! The fourth annual summer event series hosted by Phoenix Magazine and AWE Collective is back, and promises to SHAKE things up yet again. This year, weekly cocktail-making classes create a 9 week tour of nine (9) of the Valley’s hottest cocktail spots. 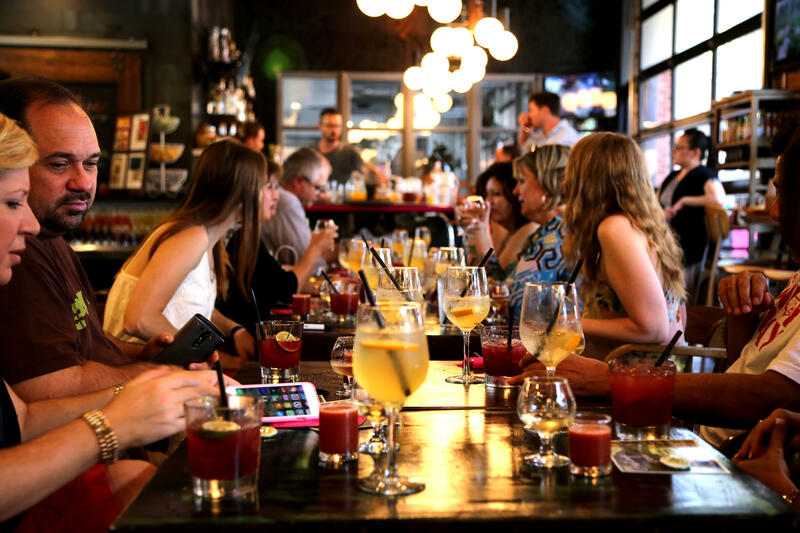 The exclusive and intimate events will give attendees the chance to bask in the presence of a different local celebrity bartender as local movers and shakers mix, mingle and sample their own cool libations alongside guests. Phoenix Magazine editor Craig Outhier will serve as camp emcee, while you sit back and sip on some of the summer’s most refreshing mixed drinks. Camp tickets include up to four cocktails, two hours of fun and a special takeaway gift! One minute he’s identifying mummified remains, the next he’s mixing up a killer cocktail. Welcome to the dynamic life of Brandon Casey: a classically trained anthropologist and renowned mixologist. He was a nominated 2015 Mixologist of the Year at the Arizona Culinary Hall of Fame, and in 2014 was selected as one of the nation’s top mixologists by The Smithsonian National Museum of American History to create a cocktail inspired by our country’s spirited past in celebration of the 200th anniversary of the Star Spangled Banner. Starting at The Parlor under Joshua James, Michael knew right away that the craft world of bartending was a fit for him. After running the bar program there, Michael hopped into the role of Spirit Specialist at Pacific Edge Wine & Spirits, a California-based importer and distributor. Winner of 2014 Arizona’s Most Imaginative Bartender as well as Devoured Phoenix’s Battle of the Bartenders “Best Cocktails of the Valley”, he misses being behind the bar, but his work at Pacific Edge allows him to experience the talent of other Valley bartenders and have a wider input in the growth of the Phoenix cocktail scene. Brian brings a unique work ethic to the bar from his past life as a cook. Presently, his long days are filled with the preparation of fresh ingredients, sodas, shrubs and bitters that end up in a beautifully presented glass. Brian has been featured in multiple publications, including Phoenix Magazine and The Tasting Panel. Currently, he is leading the charge for brown spirits in the Phoenix cocktail scene. Native to North Central Phoenix, James was compelled by an opportunity to be creative during his tenure with Karl Kopp at AZ/88. While mastering the art of the classic cocktail he understood that restaurants were more than just a place to grab a quick bite - they were an opportunity to engage. As bar manager of The Parlor Pizzeria, James had built one of the most innovative beverage programs in Phoenix - a place where food and drink co-exist in unison and harmony. Now partner with Jared Porter and Nick Campisano at The Clever Koi in Phoenix (and soon Gilbert! ), Josh continues to evolve his craft into new territory, and the accolades have followed. Shake up equal parts nostalgic cocktail curator and modern mixology provocateur and you’ll wind up with Mr. Travis Nass, spirit guide and marketing director at CaskWerks Distilling Company. For years, Nass’ DIY approach to his own housemade bitters, tinctures, syrups and tonics to keep his craft cocktails on every must-drink list in the nation. With more than 10 years under his belt buckle, Nass has been mixing drinks since the day he turned 21, ultimately earning a coveted “Beverage Master” induction into the Arizona Culinary Hall of Fame. A proud native of Tucson, AZ, Eddie Garcia is the bar manager and lead mixologist of Jade Bar at Sanctuary Resort and Spa. With over 20 years of experience, Garcia brings to Jade Bar a philosophy based firmly in classic cocktails while complimenting the essence and flavor profiles of the world-renowned restaurant Elements at Sanctuary Resort and Spa. Garcia hosts Mixology 101, the Valley’s preeminent cocktail class every Saturday at Jade Bar, and co-hosts Chef Beau Macmillan's Bar Brawl in late summer. The dream team gents at Virtu, Fernando Bambaren and Jeremy Key, have both dabbled in the hospitality realm, which lends a consciousness of the customer experience to their decisions behind the bar. Key started in the food industry at the tender age of fourteen, where he quickly developed a passion for the craft, leading him to travel the country honing his skill. He’s worked on various Valley programs, including Roy’s at the JW Marriott and Sumo Maya. Bambaren worked at the Fairmont Princess and the very well known Jade Bar at the Sanctuary resort for a collective total of 11 years before he joined the team at Virtu Honest Craft. Both have a passion for creating new cocktails and bringing new ideas to the cocktail community through the seasonal beverage program for Chef Gio's critically acclaimed restaurant.